Breakfast is included in the price of the room. Breakfast includes a wide selection of bread, cheese, sausages, scrambled and boiled eggs, juices, coffee, tea, milk. Standard rooms are small but comfortable with laconic decorations in warm cream tones, which are combined with yellow curtains. Each room has large and soft bed. Depending on a type of a room, it is has either two single beds or one double bed. 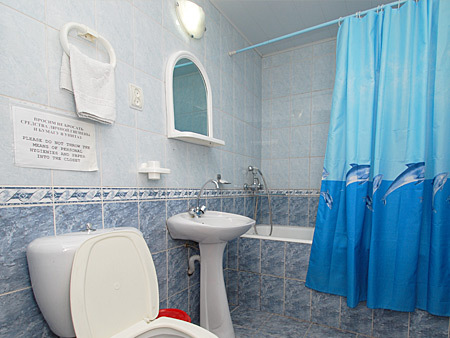 Each room is equipped with TV, air conditioner, wardrobe, bathroom with shower and necessary facilities for good rest. Spacious rooms of the hotel, which are decorated in light and soft colors. The rooms are equipped with a large double bed, TV, desk, wardrobe, and other necessary components for good rest and recreation. 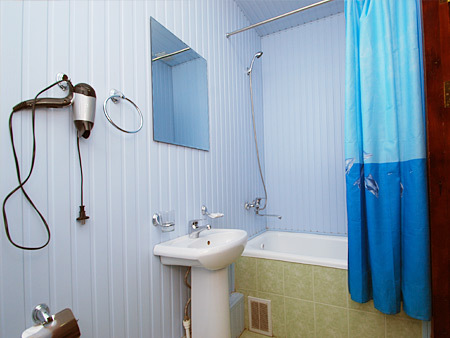 Bathroom of the rooms is commodious and has a bathtub and a shower, which help to reduce your fatigue after long day.